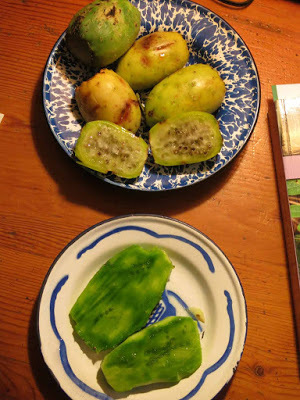 Photo shows fruits in bowl, skinned pads (nopales) in plate. I was defeated by this plant a few years ago, just could not get stickers out, especially from skins of fruit. This time, with help from Nature’s Gardens — Edible Wild Plants by Samuel Thayer, I got more serious. Used tongs to hold, scrubbed with stiff brush, used heavy duty potato peeler on pads. Still difficult, but was able to eat fruit without mouth punctured with stickers — nice mild sweet taste, lot of seeds — and last night sauteed the pads along with garlic and onions, pretty good. Any one got tips on cleaning, eating? These are so abundant, at least on the West Coast. I told my Peruvian companions I had an upset stomach. I was told a tuna was recommended. He held his handkerchief by a corner and slapped the fruit with it and then was able to handle it and peel it with his pocket knife. Was nice in my stomach. Campesino women commonly sell them in the street peeled – very cheap. If you have high powered blender like Vitamix (but it MUST be really high powered) you can just trim of the crusty rough bits on the ends and toss a bunch in. Blend then pour through colander to remove remaining pits. Spines are vaporized, gone.